Measuring intergenerational mobility – i.e. knowing how much the economic and social status of the parents determines the status of their children – and understanding its drivers is of paramount importance to remove the obstacles to equal opportunities and assure a level playing field in access to jobs and education. To this (long-term) end, an important recent trend in the literature on intergenerational mobility investigates the correlation between indicators of social mobility and a variety of meaningful aggregate outcomes. Agreement in this area is still far from being reached. Chetty et al. (2014) and Corak (2013b) find that social mobility differs across geographical areas, and that it co-moves positively with economic activity and social capital and negatively with inequality. Others, including Clark (2014), claim that mobility is low and constant across all societies and time, and thus unrelated to aggregate variables. second, that mobility correlates positively with economic activity, education and social capital, and negatively with inequality. These findings are particularly noteworthy in a centralised country like Italy, where the institutional framework is the same for all provinces. Thus, policies and political institutions are unlikely to be the main drivers of geographical differences in social mobility. The indicator of intergenerational mobility used in the study is that proposed in Güell et al. (2007, 2015), namely, the Informational Content of Surnames (ICS). The ICS is a moment of the joint distribution of individual surnames and individual economic outcomes. Unlike traditional measures of mobility, it does not require panel data nor any explicit links between children and their parents; one cross-sectional dataset of surnames and economic outcomes is enough. This approach has many similarities to the well-established methodology of looking at sibling correlations in order to infer intergenerational mobility. If economic inheritance is important, the outcomes of siblings should be correlated because they share parents and, thus, they share the same inherited economic traits. Consequently, the variance of siblings' income should be similar to the population variance if inheritance is irrelevant, but much smaller if inheritance matters a lot. This works in an obvious manner for siblings, because we know the exact relationship between them and with the ancestor from whom they get inheritance. Essentially, the same procedure works using surnames because surnames establish a partition of the population that is informative about family links. Surnames happen to be informative because surname distributions are very skewed. If there were only a few surnames, the mapping between the surname partition and family relationship would be extremely blurred. Fortunately, Western surname conventions ensure that surname distributions are very skewed. Despite the presence of a small number of surnames shared by very many people – who are very unlikely to have common ancestors – surname distributions typically contain a very large number of uncommon surnames shared by few individuals who are instead very likely to have close family relationships. In those infrequent surnames lies the power of the methodology. To get comparable estimates of the ICS we use the fact that the distributions of surnames across provinces are comparable. Thus, any differences in the ICS reflect differences in social mobility and not in other factors. The first group includes value added per capita, educational attainment, inequality and social capital. The second category refers to labour market outcomes and the degree of trade openness in each province. The third group includes, instead, a number socio-political outcomes such as life expectancy, suicide rates, crime rates and public sector activity. The heat maps in Figure 1 show that value added and social capital are positively related to higher mobility, while inequality – as measured from our tax data by the standard deviation of taxable income – and low education levels are related instead to lower mobility. This pattern also emerges consistently (and significantly) in a regression framework controlling either for value added per capita, or for a North/South dummy or for migration flows, suggesting that the results are not driven by the well-known Italian North-South divide. The relationship between intergenerational mobility and inequality that emerges visually both from the maps and in Figure 2 has a special interest on its own. 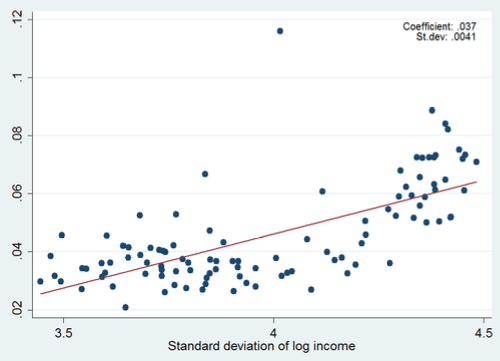 A clear positive correlation between the intergenerational elasticity of earnings and the degree of cross-sectional inequality – the ‘Great Gatsby curve’ – exists across countries (Krueger 2012, Corak 2013a,b).1 This correlation has become the focus of a large public debate, in which it is often interpreted as the result of institutional differences: inequality and the prevalence of inheritance being low in countries with larger government intervention (as in the Nordic countries) and high in laissez-fairesocieties (such as the Anglo-Saxon countries). 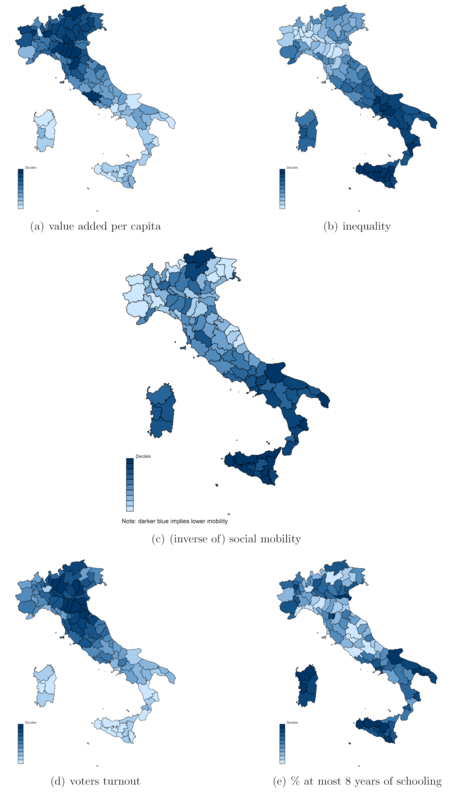 The existence of an Italian Great Gatsby curve is noteworthy because all Italian provinces share the same institutional framework: intergenerational mobility correlates with low inequality even holding constant the institutional setup. When we turn to the correlations between the ICS and the second category of outcomes – namely, labour market indicators and trade openness – results show that intergenerational mobility correlates positively with ‘good’ economic outcomes, such as employment and openness, and negatively with ‘bad’ economic outcomes, even after controlling for differences (observed and unobserved) between the North and the South of the country. Finally, the analysis of the correlations between intergenerational mobility and a vast array of socio-political variables including life expectancy, suicide rates, crime rates and public sector activity shows that the clear and systematic pattern that we document for economic outcomes and social capital does not emerge when we look at other socio-political variables. This result is perhaps not so surprising given that the interaction between mobility and socio-political processes is presumably much more complex and unpredictable than the interaction with economic outcomes. Further confidence in our results comes by a recent excellent paper by Acciari et al. (2016), who calculate income mobility measures for Italy using administrative data and standard parent-children regressions. The authors have correlated our ICS measures with theirs and find that the correlation is high and highly significant. In fact, their results are very consistent with ours. They find that intergenerational mobility is sharply heterogeneous across provinces, with a steeply positive South-North gradient. They also find that many good outcomes correlate with IGM. Summing up, our analysis confirms the evidence by Corak (2013b) and Chetty et al. (2014) on a different country and using completely different data and methodology. Differently from previous work, we exploit within-country variation and focus on Italy, a highly centralised country in terms of political institutions and policy making. This allows us to conclude that the correlations that we document can hardly be explained by differences in policies, such as those related to education or welfare. Something else, beyond local policies, must be jointly driving the degree of intergenerational mobility and macro outcomes. Acciari, P, A Polo and G L Violante (2016), “’And yet, it moves': Intergenerational mobility in Italy”, mimeo, New York University. Chetty, R, N Hendren, P Kline and E Saez (2014), “Where is the land of opportunity? The geography of intergenerational mobility in the United States”, Quarterly Journal of Economics 129(4): 1553-1623. Clark, G (2014), The Son Also Rises: Surnames and the History of Social Mobility, Princeton: Princeton University Press, with Neil Cummins and Yu Hao and Daniel Diaz Vidal. Corak, M (2013a), “Income Inequality, Equality of Opportunity, and Intergenerational Mobility”, Journal of Economic Perspectives 27(3): 79-102. Corak, M (2013b), “Inequality from generation to generation: The united states in comparison”, in R Rycroft (ed. ), The Economics of Inequality, Poverty, and Discrimination in the 21st Century, ABC-CLIO. Güell, M, J V Rodríguez Mora and C I Telmer (2007), “Intergenerational mobility and the informative content of surnames”, CEPR Discussion Paper No. 6316. Güell, M, J V Rodríguez Mora and C I Telmer (2015), “The informational content of surnames, the evolution of intergenerational mobility and assortative mating”, The Review of Economic Studies 82(2): 693-735. Güell, M, M Pellizzari, G Pica and J V Rodríguez Mora (2018), “Correlating Social Mobility and Economic Outcomes”, Economic Journal 128: F353-F403. Krueger, A B (2012), “The rise and consequences of inequality in the United States”, Speech of the Chairman of Council of Economic Advisers at the Center for American Progress, 12 January. The name was coined by former CEA staff economist Judd Cramer in reference to the upwardly mobile character in F. Scott Fitzgerald's novel.